MyPaint is a free painting program that comes with a lot of specific brushes. Libmypaint has been modified in 2016 in a form that can be used by other programs. GIMP-2.10 can use these brushes. 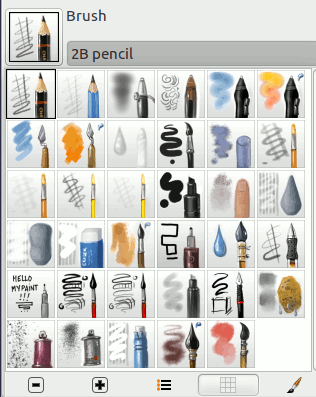 You can find many collections of MyPaint brushes throughout the Web, in a compressed format, often in a .zip file. Unzip this file into a temp folder. First go to Preferences → Folders → MyPaint Brushes. There, you will find the path to your personal Mypaint folder. Under Linux: home/YourUserName/.mypaint/brushes. Take good note it is a hidden directory. Open your file browser. Check the option “Show hidden files”. Go to your personal MyPaint folder. If it does not exist yet, you have to create it, with the brushes directory inside. Copy-paste all the unziped files from your temp folder to home/YourUserName/.mypaint/brushes. Under Windows 10 (and gimp-2.9.5): ~\.mypaint\brushes. Click on this item to select it and click on the icon that opens a file browser. In the root of your home folder, create a new folder"mypaint". The Mypaint path in Preferences becomes C:\Users\your-user-name\mypaint. Copy-paste all the unziped files from your temp folder to C:\Users\your-user-name\mypaint. 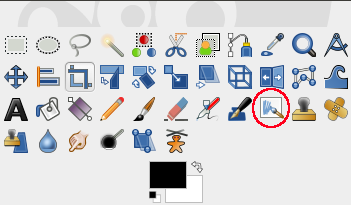 Activate the tool as below: you should have got a MyPaint brush icon in the tool options dialog. Click on this icon to display all MyPaint brushes. or by clicking on the Y keyboard shortcut. The available tool options can be accessed by double clicking the Mypaint brush tool icon. Options may act somewhat differently according to the MyPaint brush you use. To set the opacity of the brush (0.0 - 100.0). Opacity depends on a base: please see below. In the bottom bar of the dialog, you have buttons for smaller or larger icons, and view as list or as grid. 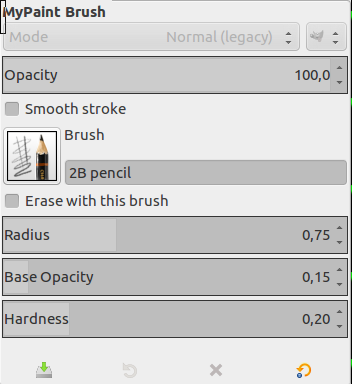 If this option is checked, the brush acts as an eraser. As for the Eraser tool, erased areas are transparent if there is an alpha layer, have the background color if there is no alpha layer. To set the radius of the brush. These values (0.00 - 2.00) are multiplying factors: if, for example, you set this option to 0.50, the maximal opacity becomes 100 * 0.50 = 50, although it is still 100.0 in the Opacity option. 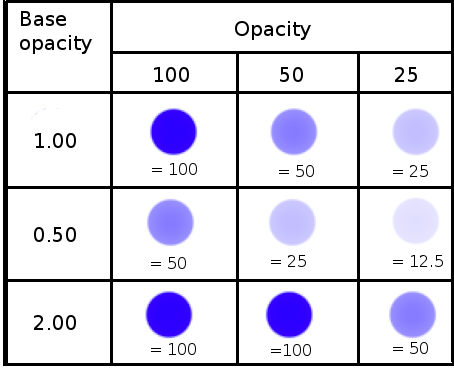 Base opacity can exceed 1.00 up to 2.00. Of course, opacity can not exceed 100. In the example, you can see that an opacity option above 50 (100 * 2.00 = 200) is actually an opacity at 100, and 25 * 200 = 50 is equivalent to 50 * 1.00 = 50. But this possibility is useful when your Mypaint brush has a default opacity less than 100. The harder the brush the sharper the brush. When you reduce hardness, the Mypaint brush may not act if the the brush size is too small. This MyPaint brush doesn't act when hardness is less than 0.70.